The early trails opened up the High Peaks to more people and laid the groundwork for today’s trail system, but some of the original trails continue to cause maintenance problems. Modern trails tend to switchback up mountains and employ trail hardening techniques to minimize erosion. In the old days, however, trails were cut straight up steep slopes. Such trails can turn into streams during rainstorms. Due to erosion, the walking surface is often characterized by rocks, roots, and loose soil. Given the poor design and increasing number of hikers, many people argue that more money is needed to maintain and redesign trails in the High Peaks as well as on other popular peaks, such as Baker Mountain in Saranac Lake. This isn’t a new idea. For decades, leaders around the Park have said the state needs to do a better job maintaining the Forest Preserve — a view often espoused when the state is looking to acquire new land. The issue is in the public eye now because of problems created by the growth in hiking in the High Peaks in recent years. Here at Adirondack Almanack, and in online forums and on social media, people have been debating whether hikers should pay fees to fund such projects and whether hiking permits should be required to limit usage. 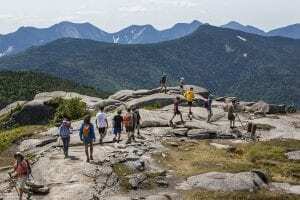 When the Adirondack Explorer questioned trail-maintenance organizations about whether more work could be done in the High Peaks, the answer was a resounding yes. As recently as the 1990s, the state had four trail crews of about four people each in the northern Adirondacks, including two focused on the High Peaks. Interior caretakers at Lake Colden and Johns Brook also worked on trails and continue to do so. But over recent years, DEC’s crews have shrunk while their responsibilities have grown as the state has acquired more land. Discussions about trail maintenance seem to surface whenever usage spikes. Sandra Weber wrote about similar issues in the High Peaks in her 2001 book Mount Marcy: The High Peak of New York. 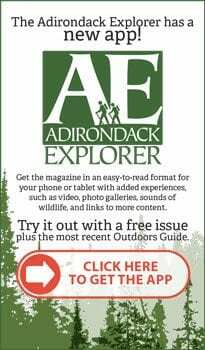 She noted ADK’s magazine, Adirondac, published an article in 1971 that raised concerns about increasing usage marring the “wilderness experience” and causing trail erosion. “In 1975, some 28,000 people registered at Marcy Dam, and it was estimated that over 35,000 people visited Mount Marcy that year,” Weber wrote. 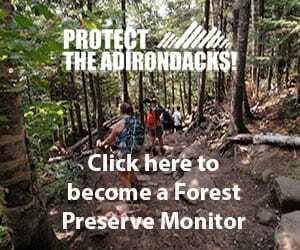 “Hikers becoming Adirondack Forty-Sixers grew from 15 in 1960 to 1970, to 126 in 1975. The membership of ADK grew from about 2,000 in 1960 to almost 9,000 in 1975. Today, it has nearly 35,000 members. Today DEC faces the same budget and staff problems and continues to rely on the same organizations for work, paying for some of it and relying on volunteer work for the rest. However, the pressure put on the High Peaks today is substantially greater than it was a few decades ago. Instead of 126 people a year finishing the forty-six High Peaks in 1975, there are now more than six hundred finishers a year. And popular summits such as Cascade Mountain and Mount Marcy might see that number of hikers in a single day. The number of hikers signing the register at Cascade rose from 16,091 in 2006 to 33,149 in 2015. 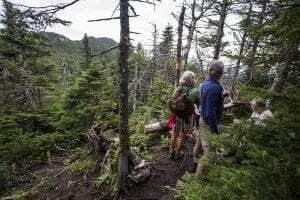 The Van Hoevenberg Trail, which leads to Mount Marcy from Adirondak Loj, has seen a similar large increase in people signing the register: 53,423 last year, a 62 percent increase from 2005. DEC relies on money from the Environmental Protection Fund to pay for trail work when it contracts with outside trail crews. In addition, the Adirondack Forty-Sixers and other groups have donated money for trails. The Forty-Sixers have given more than $350,000 in the past sixteen years to various Adirondack causes, including $169,000 for ADK’s professional trail crew. The department provided Adirondack Explorer with a list of work accomplished this year: more than two hundred miles of trail patrolled for blowdown; more than seventy-five miles of trail patrolled for drainage issues; more than forty privies relocated, and more than a hundred new signs installed. Other projects included installing at least nine box privies at high-elevation sites; improving trails on Cascade Mountain, Hurricane Mountain, and Mount Colden, and restoring campsites at Roaring Brook Falls. Goodwin said damage is especially noticeable on herd paths — unmarked routes on the so-called trail-less High Peaks, such as the Sewards and the Santanonis. These trails were created by use, not design, and lack the erosion-control features of modern trails. Also, they don’t receive as much maintenance as officially designated trails do, and they are showing the consequences of the increase in foot traffic. Should the herd paths be marked, maintained, and perhaps redesigned? That is another recurring question. About twenty-five years ago, the Citizens Advisory Committee that worked on the High Peaks management plan grappled with the issue of herd paths. Barbara McMartin wrote about the discussions in her book Perspectives on the Adirondacks (2002). She said the committee did well by closing off many herd paths and channeling traffic to one route on each peak. But McMartin was disappointed that the committee did not recommend that herd paths be redesigned “with minimal grades using switchbacks to minimize erosion.” Several people interviewed for this article said the herd paths should be marked and rerouted. 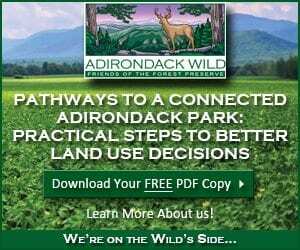 The Adirondack Forty-Sixers have been working with DEC to improve herd paths. But Adirondack 46er president Brian Hoody said the paths don’t necessarily have to become marked trails, suggesting that doing so would diminish their wild character. “They are definitely getting more use, but as long as you have an adopter [who takes responsibility for a trail] and you deal with the problems, they should be all right for a while,” he said. However, Goodwin, who represented the Forty-Sixers on the High Peaks Citizen’s Advisory Committee but isn’t officially part of the organization now, said it’s time for the organization to recognize that herd paths are not holding up to increased use. “They’re just going to have to accept the fact that these trails are going to become much more evident and need to be laid out strategically and maybe not marked as heavily as some of the state trails, but they need to become real trails,” he said. Add that to the list of work that Goodwin and others believe needs to be done in the High Peaks. “One of my sayings has been that if you’re in the trail business in the Adirondacks, in this era, you’ve inherited about 125 years of poor design and maintenance, and it might take another 125 years to fix it all,” Goodwin said. 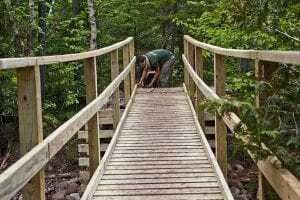 Photos, from above: The state pays the Adirondack Mountain Club and other groups to maintain trails (courtesy Seth Jones); A worker puts the finishing touches on a bridge over Marcy Brook in 2012 (a Nancie Battaglia photo); Sewards herd path (Nancie Battaglia), and Cascade Mountain (Nancie Battaglia). Correction: A quote from “Mount Marcy: The High Peaks of New York” by Sandra Weber was corrected after three words were accidentally omitted from the original article when it was first published in the print edition of Adirondack Explorer. 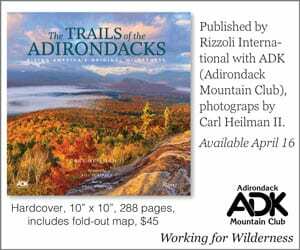 In this version the quote reflects that the Adirondack Mountain Club’s “membership grew from about 2,000 in 1960 to almost 9,000 in 1975” to 35,000 members at the time of the book’s publication in 1991. There’s no glamour for politicians in fixing stuff – lots in being able to take credit for new acquisitions. Thinking past the next budget or the next election seems to not happen as much as it should. Couple that with anti-government spending fanaticism, downsizing and privatizing at every opportunity, and the whole ‘doing more with less’ mindset… is it any wonder the trails need a lot of work? Or that there’s so much more that could be done? This false economy has more than a little to do with the Railroad situation into Lake Placid. If the state had funded the 1996 plan the way it was supposed to, we wouldn’t be ripping out perfectly good track for one more trail, driving out two businesses that bring thousands of visitors into the area, there’d be a full connection to the national rail passenger network and a full system of supporting trails around it. Instead we’re getting a Solomon’s decision splitting the baby in half and pleasing no one. But it must have looked cheap and easy to the Cuomo administration compared with doing it right. Ditto for the rest of the land decisions that don’t come with budget or staff to do it right. Ironically, this whole article also makes a case for the railroad here, and for others to be rebuilt. The reason–we need them for their efficiency and capacity, just as a large city might. And this is in an area that isn’t a large city. What might an American version of Switzerland look like? Something I strongly recommend for reading for people here, both for its message and because it’s a good read. Interesting. Are we talking about MTB trails. I’m confused. Recall having a pleasant exchange with a certain repeat poster here Re: mountain bike use within the blue line. He said something along the lines of ‘would need to be a series of switchbacks’ to accommodate bike use and therefore prohibitive, yadda, yadda, ya. Was the typical desperate attempt at rationalizing banishment of bikes in forests, wilderness or anywhere a walker/hiker may wish to recreate. Not sure why hiking trails would need to follow any type of trail design anyway, as we all know that footfalls produce very, very little impact on soils. At least a 10 or 100 fold lighter impact that bikes. Bikes are more on erosive par with ATV’s or Jeeps than footfalls. They essentially require paved roads. “Footfalls” produce very little impact just the same as bikes or vehicles…if you have only occaisional use on firm dry soils. Lots of use or use on soft wet soils results in impact, even just foot traffic….thus the point of this article. You need to keep the trails away from water and water away from the trails. I know. I was being cheeky. 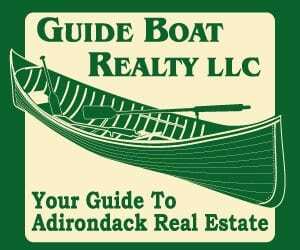 Thank you Mike Lynch for your continuing series on the heavy usage of the Adirondacks, especially the high peaks region, and the many negative effects this is having and will continue to have. I think a nice subtitle for these articles could be “We’re Loving the Adks. to Death”. This post expresses many of the feelings I’ve had in the last three years since I retired and ‘returned’ to hiking after a hiatus of about 15 years. First up, is this a new problem? No and Yes. People love to dredge up old articles from the 70’s and 80’s for example that convey many of the same thoughts. But when I became a 46er a way back in the early 70’s you could talk with hiking friends and usually identify 10 or fewer trails that were heavily eroded from high usage(think Adk Loj to Marcy). St. Huberts was considered a haven of sorts for trails the way they all used to be due to the limits that the AuSable Club made on their trails. But even their trails are now suffering from overuse(and thanks Mr. Goodwin for all your pertinent remarks quoted in this article). But no more; as Mike Lynch has stated in previous article there’s been a steady increase in hikers the last 10 years that is putting more erosive pressures on popular trails than they can bear and that is overwhelming even the noblest of efforts by the trail crews of the ADK Mt. Club and the many volunteer efforts by their members and the 46ers. Ah, the 46ers. As the article notes the organization donates generously to help pay for the costs of the trail crews. But despite 2015 being the 3rd straight year of a record number of 46ers(and I’ll bet 2016 will be another record) the club seems to think that they are doing enough vis a vis their donations for the trail crews to deal with the problem. Nonsense. Perhaps the 46ers have outlived their original goals and are acting like a magnet to the iron filings of hikers drawn to these 46 peaks. The discussion in the article above was discouraging, especially relevant to the trails peaks. Hey, isn’t about time we stop calling them the TRAILESS PEAKS? They’ve got trails all over the place, and they are proving an ecological disaster, thanks almost entirely to the legions of erstwhile aspiring 46ers. 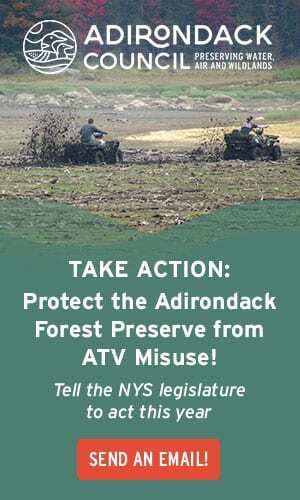 I suggest a radical proposal for the 46ers, hopefully one that will be supported by the ADK Mt. Club, the biggest and most powerful of the Adk. organizations. I would like the 46ers to propose that priority #1 for the professional trail crews, with much-needed support from the DEC, would be to construct ‘regular’ marked trails on all of the trailless peaks, made with modern designs like switchbacks. The ‘adventure’ Brian Hoody mentions in climbing these on the numerous(and far too many) herd paths is long since a thing of the past. These herd paths are quickly becoming like the old fire tower ranger trails, which essentially were straight up. They are becoming eroded at a rapid pace which in turn spreads more herd paths. The 46ers are the organization that created this dilemma, they are the organization that should realize what their aspiring and current 46ers are doing to these mountains. There is more I could say but this is probably too much as it is. Please continue Mr. Lynch to fight the good fight. I have no idea, and I’ve read a ton of them on this site and elsewhere, how to limit the number of hikers to the ADKs when there are trails everywhere accessible. But I do think we have an obligation to do what we can to make all those hiking boots do as little damage as we can. This stuff isn’t rocket science. If Albany is going to place a heavy demand on the HPW/ADKs to increase tourism, it needs to pay for maintenance and patrolling. I do not believe Rangers should be maintaining trails other than the occasional downed tree. Nor do I believe concerned citizens and hikers should be donating time for trail activity. Albany needs to be funding full-time, professional trail crews capable of getting ahead of the damage – not just playing catch-up. Currently, Albany seems to see the HPW/ADKs as a resource that can be used up without maintaining it – just like fossil fuels. If Albany wants to continue to use these areas as a source of local income, it had better begin to PRESERVE them – not just buy them. I guess I should restate that – I don’t believe they should be relied upon to maintain trails. This should be first and foremost the responsibility of NYS professional trail crews if they wish visitors to have a positive experience on NYS trails. Seems a no-brainer to me. Politicians only want to buy & build, not maintain. I’d be happy to pay a trail fee if all the $$ go to maintaining the trails and associated facilities…or better yet, have options for a one-day, week-long, or annual pass. FYI, anyone can purchase a Trail Supporter patch from DEC for $5. This can be done online or wherever licenses are sold. Yup. But WHERE is the money going? Who knows? But you get a nice patch, which is more than I get from my NYS income tax. Interesting article Mike. It echoes the recent ones we have seen about increased usage. I am curious what the year over year trends look like. I have seen the stats that show how the use has changed over the last decade but what is the rate of change year to year inside that period. I think I agree with Tony on the “trail-less” peaks. Anyone who has hiked them recently knows they are far from trail-less and the “wild” experience is a bit of a stretch. My teenage son was able to identify and navigate all of them without any difficulty (or a map and compass) which we had but didn’t need. The idea of creating new, better and more robust trails to any and all of these peaks sounds like fun to me, where do I sign up? Good article, as always, keep on plugging away! Outside of the High Peaks,the Ranger Trail on Poke-O-Moonshine, has shown lots of wear-and tear as its steep direct route to the summit has eroded. Straight and direct was the old mode of trail design, or rather non-design. Hikers could go straight up the mountain quickly and efficiently on the shortest line. And water would and does come straight down it, causing big erosional problems on these antiquated routes. In 2011, DEC announced it would consider closing the Ranger Trail because its layout was unsustainable and damaging to the mountain’s ecology. DEC did not have the funds to maintain the trail, since there was a second route, the Observers Trail, up the mountain that could handle the traffic. The Friends of Poke-O Moonshine, which restored the fire tower and there and reinvented the Ranger Trail as an interpretive route, stepped up to the plate to rescue the historic and scenic trail. As of this week, The Friends have raised $196,000 over the past three years and have funded two seasons of trail work to rebuild and re-route the Ranger Trail. 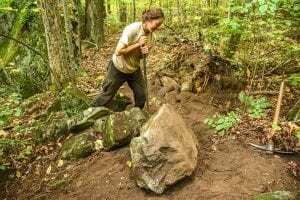 The ADK Pro Trail Crew and Tahawus Trails have worked together, under DEC supervision, and done an outstanding job of building beautiful and solid rock staircases and drainage structures using a creative and interesting trail layout, to begin to repair the problems . The Friends estimate two more seasons of trail work at a total cost of $250,000. There is $54,000 more to raise to complete the work and to create an ongoing trail repair fund. 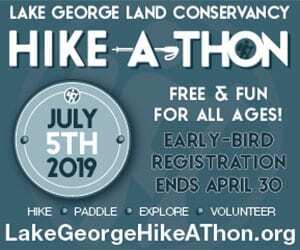 Come hike the renewed Ranger Trail and see the exemplary craftsmanship these organizations have employed to save this fascinating route up Poke-O-Moonshine! Go to wwwpokeomoonshine.org to make a donation and support the project. The pubic-private partnership at work here is a model of what is best about the stewardship of the Adirondacks. Sum(m)it Up For Poke-O! Nice post, and credit should also be directed to the Algonquin chapter of the ADK Mt. Club also which has been one of the chief sponsors raising money for this project. That said, the positive results already achieved and to come on PoKo show the daunting challenges ahead in dealing with a whole host of trails that are now eroded and are being eroded at an ever-increasing pace. In my post above I noted the stellar efforts of the pro trail crews of the ADK MC but in the end this approach simply can’t keep up with the challenges faced. It continues to be like one step forward and two or more steps back. Hike up Jay Mt., Hurricane(Rt. 9N trail), Lyon Mt. and the partially finished ranger trail on POKO and see what a huge difference these new and modified trails can make. But as some posters have noted above, the cost and effort needed to address the many trails in the Adks. that need this is well beyond the capabilities of private groups like the ADK MC and 46ers and others. The DEC needs more funding and more resources at work to preserve these hiking treasures. 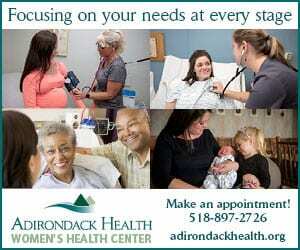 Andrew Cuomo visits the Adirondacks often and promotes them while doing so. But instead of snowmobiling or rafting I wish he’d hike a few miles on these old trails that have become mainly rocks and roots and mud. The ADK Mt. 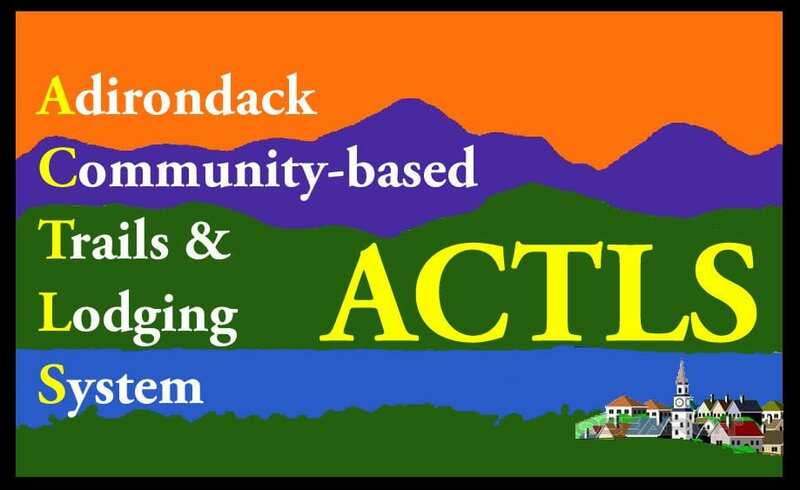 Club has a huge membership and a presence in the state legislature trying to wield influence on issues pertinent to the Adirondacks. I call on them to emphasize this issue more. And as I and Steve O. have noted, good on you Tony Goodwin for your remarks on the so-called trail-less peaks. C’mon, fellow 46ers, let’s get the 46ers to change their whole attitude about these peaks. Well constructed modern trails are needed on all of these mountains as more and more and more aspiring 46ers climb them. Do the leaders of the 46ers want to cling to this aura of wild and free bushwhacking to add to their luster or do they, in the end, care more about saving these mountains for future generations? Many members, including myself, asked the 46rs to put a cap on membership decades ago. This, of course, has not happened. But I don’t know that it would matter if they did. People are what they are, and will just continue doing the 46 or some other list even without the 46r club. Now that records can be kept online, a formal club isn’t even necessary. Albany realizes they need to maintain public buildings, roads, and other infrastructure. Local volunteers don’t perform this work – professionals do. Just like any other infrastructure used to promote tourism, trails and campsites need to have their infrastructure maintained as well. Albany is just using the HPW as a cash cow. That cow is getting old & sick. Beginning of this month, Oct 2016, over the Columbus Day Holiday weekend I took a motorcycle ride through Adirondacks. I’ve been coming up to the Adirondack States Park approximately 50 years so it’s safe to say I’ve seen some major changes. To come to the point…I WAS BLOWN AWAY BY THE CHANGES ON RT. 73!!! THE PARKING ALONG THE SIDES I OF THE ROAD…THE JAMMED PACKED TRAIL HEAD PARKING LOTS…IT WAS HARD TO BELIEVE. There were lines of people on the trails. It is wonderful to see that the Adirondacks are so popular. I’ve been sending people to the park for years and will continue to do so. BUT I WONDER ABOUT THE IMPACT I’VE BEEN SEEING THROUGHOUT THE PARK . The herdpaths on the ‘trailless’ peaks are an ecological disaster. They were never intended to handle the hiker volume they have been receiving in the last decade or so. As such, you have places like the braided mire near the vly on Marshall, which has led to not only degrading the wild character, but has also contributed to the destruction of the fragile boreal habitat in that area. When you compare this route to the much older route from Cold Brook Pass that sees a fraction of the use it is easy to see what the impacts are when compared to the far more popular Herbert Brook route. I do a few loops a year up the Pass and down the Brook or vice versa and the degradation in just the last 5 years is astounding. The same goes for Cliff Mountain, which is now becoming a massive $hit show. The herdpath now splits off from the Redfield herdpath a couple hundred yards from Uphill Brook lean-to. It immediately starts following an old section of the Twin Brook Trail, through a swamp. Because of this, a braided mess of paths has developed in only a few years since this reroute in order to avoid the swampy area. Further on in the steep parts the trail has eroded to be 30 feet wide or more in areas where hikers scramble up the steep sections. It’s still widening, and more and more soil and trees are dislodged from the fragile ground in this area on a monthly basis. The herdpath up Seymour, and the north trail to Seward are others which readily come to mind when thinking about the worst of the worst. The summit of Panther also has major issues with devegitation. The path up Gray has been rerouted once, and likely will have to be done again soon, this leaves scars on the landscape from human use that take hundreds of years to recover from. Once the soil is scraped off to rock, it’s possible that the landscape is permanently changed at that point, as runoff will also find these locations, and soils may never reestablish there as a result, making revegitation impossible. The time of the herdpath to the summits has passed. It’s time to come up with a new plan to manage these routes that has much less impact on the resource. Those who are resistant to the idea either haven’t seen these places recently, or are so overcome by nostalgia that they are incapable of thinking clearly on the topic. The 46ers need to wake up and join us in the 21st century. The biggest reason I refuse to join or donate to that organization is that I don’t at all share their blindly altruistic vision of the high peaks. Wake up people! The resource is under intense pressure. It’s time to face that reality and do something about it. Selling patches and t-shirts to the masses clearly isn’t getting the job done. Time to reassess. What a great post. I think the 46ers have become caught up in their own aura, if you will. As Mike Lynch noted with statistics in one of the first articles in this series, the 46ers keep having record numbers ‘make it’ each year, which of course means the pipeline is filled with more. The reaction of the powers that be in this organization seems almost like a business approach; keep expanding, tout the numbers to show how successful they are. Even their major upgrade to their magazine ‘Adirondack Peeks’ seems to be over the top. It’s become a highly professional, glitzy magazine with long(and good) articles, complete with nifty graphics and stellar photography. It’s nice, but is it necessary? Couldn’t they cut the budget in half for example and put these funds to better use? Thanks Mr. Heller for graphically demonstrating with specific examples of the destruction of big swaths of the trail-less peaks, and by the way, as you noted, areas near the peaks as well. In a way they are becoming an ecological disaster. Yet President Hoody seems unconcerned with this damage and blithely asserts that to have constructed, marked trails would tarnish the ‘wild’ aspect. Most of the herd paths reflect the old adage of straight up where you can, and with the heavy traffic, be it mud season or not, the erosion begins. And as Mike duly noted, when it rains and/or the snow melts gravity rules and those indentations made by all those boots become channels for the water. You know the rest. I urge conscientious 46ers to write letters to their organization urging changes to their whole philosophy; perhaps just in regard to the trail-less peaks but maybe even long-term goals of the organization itself. The future of the Adirondack peaks for hikers yet unborn is more important than the self-righteousness of the Adirondack 46ers. Not my friends. I realize that lots of people respect the 46ers organization, but currently, I’m not one of them. It’s a t-shirt club. The Friends of Poko raised more money in 2 years on their own than the 46ers organization as a whole donated to the ADK trail crew in a decade. Don’t talk me to death about who is out there doing what. I see it and do it. The 46ers need to take a long look at themselves and decide what their role is going to be going forward. Some of these comments make it sound like the 46ers are responsible for what is going on in the HPW. That is nonsense. The group has about 8000 members, many of whom are dead! 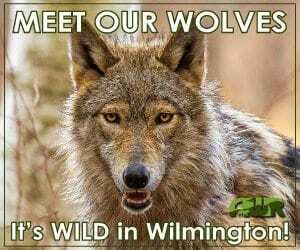 The HPW has about 150,000 visitors each year that is the problem – not these guys. If the state cannot properly manage the area for the number of users than figure out how to limit the use. It’s simple. I agree. The 46rs are at least partially responsible for making remote peaks in the HPW a destination, but they are a small part of the continuing overuse & damage we see today. That is due to NYS and local communities hyping the HPW and surrounding areas to promote tourism. Tourism that may not continue to be sustainable for much longer unless some proactive management of the natural resources takes place. If the governor hits a few potholes on Rt 86 on the way up to the HPW, he would likely have them filled pronto. 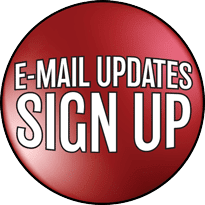 Backcountry trail damage – what’s that?? Who’s gonna see it?? Will it help me in Albany? Seems to me like this group is also encouraging climbers to visit less popular peaks that don’t get that much use. You can’t become a 46er if you just keep climbing Cascade! I could go on at length with more examples, those I gave were the ones that I have recently seen which are changing at a rate so fast that sometimes the landscape features are significantly different in certain areas between my visits. I volunteer to maintain the Uphill Brook lean-to and a couple others down by Lake Colden, so I see this area several times a year and I notice the changes. Like it has been mentioned in the comments here, it’s often one step forward and two steps back, both with regards to maintaining the structures and also the trails which reach them. The use level is exponentially higher than the labor and materials available to maintain the resources. The whole situation is alarming, but it’s often the case that things have to reach a crisis proportion before anything gets done. Unfortunately in the case we are talking about here, once things reach crisis proportions, it’s all too often extremely difficult and costly to begin remediation efforts, if it’s possible at all. One thing that I do know which is encouraging is that R5 Lands is now looking into the situation and is developing plans to address certain concerns. As was noted in a previous article, a lot of trail work is being done between the top of Avalanche Pass and Lake Colden, and on Mt. Colden itself, amongst other locations. While I am not at all a fan of massive structures made of pressure treated lumber effectively “paving” the route with chemically impregnated wood, I think it’s a good temporary measure until a more sustainable and less unnatural solution can be achieved. 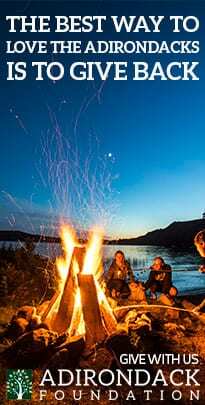 Pressure treated materials are a very poor choice for wilderness settings for the same reason they are often forbidden from being used below the waterline in many Adirondack lakes. They are poisonous and have a harmful effect on some basic components of the ecosystem. We can and must do better than this, but it will take time, money, and a lot of labor. Tourism makes dollars. Good tourism means we have to reinvest at least a part of those dollars into maintaining the trails. Makes sense to me. Would folks here be okay with the state not purchasing the Follensby Pond tract and instead using that money to maintain some of then property we already have? The state has the money they just don’t think that maintenance is a priority. How can we blame them when many people are screaming for NYS to just keep adding more and more land (none of which is really under much threat of development) to the Forest Preserve. Until that dynamic changes we will continue to see places falling apart. Kinda interesting how the majority of hikers, bikers, paddlers, equine folks, etc. don’t feel like they should pay anything extra. Yet parking areas, kiosks, even rest-room facilities are maintained at taxpayers expense for these very groups…. Hunters, anglers and trappers having been willingly paying through the nose for nearly 100 years to enjoy their activities through license sales in New York State. Federal tax levies upon many of the items used to enjoy their outdoor past-times are funneled into State coffers annually to be used for outdoors related programs. The article is a good summary of where we are now regarding High Peaks trails and where we need to go in the future. The techniques for better trails are well-known, but as David Thomas-Train’s post about the Poko Ranger Trail shows, progress isn’t cheap. I was able to donate $250 which I suggested would build two steps. David replied that was just about right given money expended to date and the number of steps set. ATIS built the current Rooster Comb trail in 1998 at a cost of $30,000 for 2.5 miles of gentler terrain than the Ranger Trail. Since then, ATIS has spent at least that much more on additional drainage and steps. The new Jay and Hurricane trails are great improvements, but they will both require significant additional work over time to prevent deterioration. As for funding for all of these potential improvements, private donations have been increasing in recent years, and I think that going forward we need more private funds, but then expect the State to match those funds. I am still very skeptical of a hiking license given how much it would cost to administer and enforce. I also worry that once people had been charged a fee to hike, they wouldn’t be as likely to make the kind of donations that are currently essential. Thanks for the link to the Beaver Brook Trail. I’m seeing these pinned steps that you are talking about and I have to say, I’m not impressed. Drilling into bedrock in order to facilitate the installation of 6×6 landscaping timber steps is not what I call wilderness ethic. In fact, from my point of view it’s exactly the opposite, it’s unethical in a wilderness setting to do this. Drilling holes in bedrock to set metal pins which are used to attach pressure treated dimensional lumber does not at all evoke a setting mainly untouched by humans. In fact it does quite the opposite, it evokes a setting where humans have manipulated the landscape for their own personal gains and desires. It’s no doubt a difficult balance to strike, but I think in this case especially, that less can be more. One thing to keep in mind is that the Whites and the Adirondacks are managed under different principles. It’s therefore not always best to look at what land managers in the Whites are doing to address similar issues to the ones being faced here. The management policies in the Adirondacks are much more strict. We would never allow horseshoe rock shelters on our summits. We would never allow a privy the size of a decent hunting blind complete with windows, skylights, and wood interior paneling. The shelter structure on Marcy you may be old enough to remember, but I have only seen pictures, thankfully. We moved beyond those types of nonconforming uses decades ago and I believe that we are much better off for having done so. 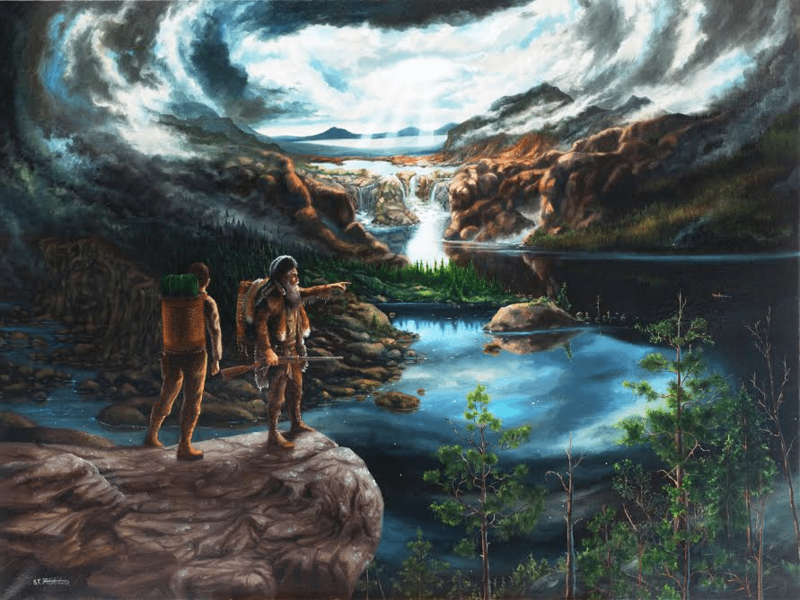 Let’s not make so many hiker improvements and accommodations that we begin to lose or wilderness identity or worse yet make it into a huge farce. I think temporary solutions are required at this point because of how far things have deteriorated, but let’s keep them temporary until a better solution can be worked out. Let’s also keep our rock drills at home and out of the wilderness. Thank you for everything you have done for our trails and with ATIS over the many years of service you have dedicated. This is just our latest challenge, and like those that have been faced in the past, we will get through this as well. This is the new staircase on Colden’s southwestern side (i.e. Mount Colden Trail). The staircase on its northern side (L. Morgan Porter Trail) is also attached to the rock. I’ve hiked the Beaver Brook Trail and seen the minimalist stair-treads attached to rock slabs. They’re also employed on the Fishing Jimmy Trail (near Lonesome Lake Hut). The one thing they’ve got going for them is “minimalist”; they’re less visually intrusive than a full-blown staircase. The Beaver Brook Trail also uses steel rebar for steps and handrails giving it that “Via Ferrata” vibe. Not a fan! If you have to employ “heroic engineering efforts”, like a 65-step, winding staircase to prevent further erosion, maybe the whole darn trail should’ve been rerouted? Having run a trail crew in the High Peaks, I will agree with Tony that switchbacks and re-routes are useless in the higher elevations in the Adirondacks. Such efforts at protecting water quality, reducing further erosion, and providing useful and safe infrastructure are entirely within the tool box of trail workers within the Wilderness designation. I didn’t mention switchbacks, I said “re-route”. Regarding “re-routes are useless in the higher elevations”. That’s a blanket statement implying existing trails have optimal trajectory and there’s no better terrain to be found nearby. We both know that’s not true; even the article mentions High Peaks trails have a less than optimal design. The fact the trail to Cliff was slated to be re-routed (a new trail was surveyed and approved but then the project stalled)suggests re-routes aren’t “useless” and the original trail builders didn’t select the best terrain for the job. Colden’s long abandoned eastern trail ran straight up the fall-line along its exceedingly steep eastern face. The L. Morgan Porter is effectively (if not by design) a re-route of the eastern trail. FWIW, the new staircase on Colden’s SW side is located at 3700′ elevation (~1150m). That’s not particularly “high” but the trail’s location is the problem. A quick glance at a topo map (or in Google Earth) indicates there’s less-steep terrain to be found along Colden’s southeast shoulder. If you said it was an issue of cost, I’d buy that. Surveying and cutting a new route along the southeast shoulder would take more time and effort than adding stairs to an exceedingly steep, off-camber, but *existing* trail. Having said that, the new staircase mitigates only one of many steep pitches along the trail. Thanks for the feedback Taras. I haven’t been up the Colden SW trail since late May, so I have yet to see the new staircase, but I have seen the others on Colden that were finished in 2015. They are awful. I’d support closing the route before long before I’d support this type of massive construction. We often discuss cost when we have these conversations and often enough that leads to a discussion on the limited availability of funds for trail work. I’d be curious to know about costs per mile for the various different options to address the situation. How much does it cost per mile to boardwalk long distances of trail like what is being done in Avalanche Pass currently including labor and material? How fast can a mile of this type of work be done? How does the cost of boardwalks compare to the costs of turnpiking? The cost of building rock stairs as in Panther Gorge? 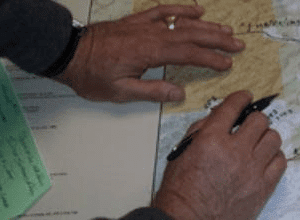 How do those options compare with the cost of surveying and cutting g a new route? We just don’t have the data to make any reasonable conclusions about this, so it’s hard to say which methods would be best in what situations because we know very little about the costs. Here’s a fun little exercise. If we look at the average 10 foot section of boardwalk we can attempt to impute the cost of installing it by estimating the materials and time required to build it. Two full dimension 10 foot pressure treated 2×6’s. About 40 dollars. One 10 foot pressure treated 6×6 for building the supports. About 30 dollars. Nails, and other required hardware. About 3 dollars. So before we add labor we are at 73 dollars per 10 foot section. Labor is variable, and some of the work is done by volunteers but if we say that when the work is being done by paid trail crew members we have to add another 20 dollars per 10 foot section. We don’t have to add this if it’s being done by volunteers. So we can now ballpark the costs of 1000 feet of boardwalking at around 7000 to 7500 dollars if done by volunteers as 9000 to 9500 dollars if done by paid crew. Somewhere in between if it’s a mix of labor types. That seems like it costs a lot more than a survey and a new trail, turnpiking, or rock staircases. Clearly the costs of these mammoth pressure treated staircases on Colden and on Ore Bed cost significantly more per 10 feet because of the increase in material and labor costs as compared to building simple boardwalks. I’d estimate 4 to 5 times the cost, perhaps more. With this in mind there has to be less expensive and less offensive ways to get the job done. It’s past time to look into these other options before the HPW turns into a pressure treated jungle gym. Good point and a convincing assessment. I assumed the man-hours involved in first surveying a good route and then cutting it would exceed the cost of the raw materials needed to create one or more staircases … but that may not be true. I think we can agree that regardless of which is the cheaper solution (entirely dependent on the terrain), staircases seem like the “nuclear option” to prevent trail-widening. Gosh, if Colden’s staircases represent the “threshold” for terrain needing stairs, both of us can easily think of *dozens* of other places that would qualify to be “staired”. Irony alert: you’d need to cut down a forest somewhere to supply the lumber needed to construct these marvels. Plus a swimming pool of copper azole to preserve them. Personally, I enjoy the challenge of some routes as they are, and adding accouterments to facilitate ease of passage would ruin that for me. It’s where there is undeniable damage being done to the resource that I think that something has to be done. I prefer something other than the “nuclear option”. On “the last day for shorts”, as you put it, I climbed Cliff. First time since 2014 (I prefer Redfield and am not counting rounds) I was surprised by the changes. Astounded in some cases actually. That last big move before the false summit is getting a bit difficult, especially for the inexperienced. I’m small enough to get low and move up the diagonal crack pretty easilly, but I can see where this might be a difficult or even dangerous move for someone on their first round. I did make an interesting observation that I hadn’t made on previous trips up Cliff. That last move is clearly stopping people from reaching the summit. The amount of impact on the ground below it is much greater than that above it. I was also reminded how enjoyable the area between the two summits can be and what the difference is between normal herdpath impacts and what results from overuse combined with a lack of maintenance. It’s a great example of the difference between the two and I encourage anyone who wants to see first hand to go there and see for themselves. Another great way to see an example of this is to do a Marshall loop. CBP and herdpath is nice and much like it’s been for 25 years. Herbert Brook has gone to hell in half that time. Though I commend the Herbert Brook adopter for having sorted out some of the worst issues over there in the last 5 years or so, it’s more than one volunteer can manage. While there would certainly be some costs associated with a license system, I don’t see enforcement being particularly onerous. State police don’t drive around all day pulling people over just to check their licenses. Same with DEC checking hunting/fishing/trapping licenses. It is done sporadically and when someone is found committing a violation that prompts a check. It is basically the honor system with a penalty for not having one. I don’t see it as something one needs to show at the trailhead in order to get access to the trail like a pass or day-permit would. Again I just seem to have a philosophical block on someone needing a license to go for a walk in the woods. Hunting and Fishing sure I buy them every year. This one just seems weird to me. I guess we do need to start treating it more like a parka and collect the money at the gate. Too bad. As long as the penalties for not having said license are strict enough to prevent people from viewing any fine for noncompliance as “the price of admission”, and the local town justices are on board to see that these violations aren’t swept under the rug, it’s not a bad plan and one I support if it’s implemented properly. Paul talks about having a license to take a walk being counterintuitive or rubbing him the wrong way. I can totally understand that sentiment, but I also think that attitude trivialize the situation to some degree. It’s not just taking a walk we are talking about here. It’s walking in a sensitive area that receive negative impacts as direct result of this walking and the human presence that comes with it. Its not the impact of one individual or group of individuals that is at issue here. It’s the cumulative effects generated by ALL users. The very aware and careful folks along with the utter slobs. Since we can’t pick and choose who should be allowed and who still needs to learn some things before venturing out, a system of information and education that is coupled with a “licence/permit” program that has a fee associated with it is a reasonable concept to study further and perhaps implement on a trial basis in some areas. If the legislation mandated all fees collected to go directly into the DEC trails fund that would be even better. I think it’s something that we need to try though, even if just on a limited and experimental basis. Those who continually say it’s an outrageous concept and aren’t willing to look at it as a potentially viable option are in my opinion part of the problem. I call them the something for nothing hikers. They get what they want from the resource without ever having the intention of giving anything meaningful in return. The “it’s free for all of us to use” crowd really needs to assess their attitude and understand that it’s not free, it costs taxpayers lots of money every year and clearly more funding and labor is needed to properly address the issues. There are other ways to raise the money of course. You could raise sales tax in all counties in the park and earmark the funds. You could put toll booths on I-87 between Lake George and Chazy. 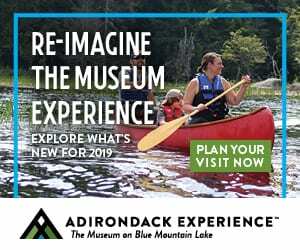 You could ask ADK and the Town of Keene to make parking at the Loj and Garden 30 dollars a day and 50 for overnight use with the understanding that the increase in revenue would go to trail crew funding. There are lots of ways to raise the required cash. The licence idea still seems better than most of the other alternatives. I agree with the bulk of what you say but I am not a big fan of raising certain county/sales taxes to pay for maintenance of a Park owned by all NYS residents. The Park is a NYS entity, not a county or town entity. Why should only people who live in these counties be expected to pay more taxes on a daily basis throughout the year than a county outside of the park? The Park is a NYS park and all citizens should be responsible for upkeep. The issue of pay parking and day use fees may work to raise funds, but it does little to require minimum backcountry education, which is another big part of the problem. The way I see it, licensing/certification can help raise cash and educate the newbies at the same time. 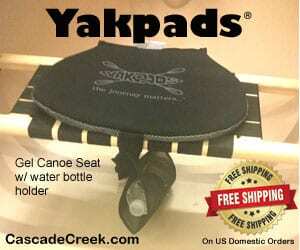 It could be required for any state land, ADK trails/waters, or just the HPW. I think Catskill and ADK trails & waters would be the logical choice. Yeh B. I don’t believe in any of the alternatives I put in that bottom paragraph one bit. I put them there to illustrate some of the other possibilities for raising revenue. None of those alternatives is as practical as a licensing program. Some of them are rather outrageous to be sure! At the risk of being the skunk in the room, this whole article begs the question of ripping out the railroad. Why do it when you already are short, severely it seems, on resources for maintaining what you have now? Where will the people be to maintain the rail trail when the railroad goes away if you are short on people now? Do you think the railroaders will come back to take care of bridge maintenance and ditch clearing for a trail after the treatment they’ve received? You have other abandoned rail lines, some going to places not reachable otherwise, that would be potential candidates for trails. I’ve been told parts of the Bloomingdale trail are badly overgrown and impassable now because of this shortage of resources. Is the proposed rail trail wise? It truthfully looks worse by the day. With all respect Dave, I don’t think that’s a problem for many of the trail supporters. For a number of them, all they really want is the tracks gone. If parts of the trail become unusable, many of them will be happy enough if they just keep the sections around their towns open for local use. Then on the other hand I have very recently hiked on marked trails in the Adks and been totally alone the entire way–get off the most popular trails on the most popular days of the year. Even on the popular High Peaks trails if you choose your date you will encounter few people. There are certainly purists, including a former DEC forester then in charge of the High peaks, who will argue that any aids to hiker travel or resource protection (other than natural rock) should not be used in designated wilderness. If the trail requires such aids the argument goes, then it should be closed. Well, by that standard most of the Range Trail and many other High Peaks trails shouldn’t exist. Are you suggesting that such trails be closed? On a slightly different subject, are there any recorded instances of moderate to major slides being caused by trail erosion? Just curious. It seems moderate/major slides are increasing in the HPW. Ore bed gave way during Irene. It probably would not have been nearly that extreme if hiker erosion wasn’t already present at that location. We have a different recollection of the Orebed trail. It was a victim of the slide, not the cause or an accelerant. The trail *paralleled* an old, overgrown slide (I recall seeing it through the woods). Irene “refreshed” the old slide which gave way well *above* the trailed section. It swept down through un-trailed woods and wiped out the lower, least-steep portion of the trailed section … where the “Stairway to Heaven” is currently located. That’s the Orebed trail running along the old slide based on USGS Forestry images. Slowly decrease the map’s opacity from 100% to 50% and you’ll see the greatly expanded slide appear (it’s underneath on another map layer from recent Google Satellite images). The old slide started peeling off the mountain well above (and away from) the trail. IIRC the slide in question originally began below the Saddleback sub-summit and took a turn somewhere around the elevation of the Saddleback/Gothic col. It then roughly paralleled the Ore Bed trail but after the turn it was much less steep and had grown in considerably. I suppose that I may have jumped the gun slightly in suggesting that the trail was a contributing factor as the enormity of the ‘new’ slide would have taken anything in the area with it regardless. How about the cable “handrail” on Gothics? Has that erosion-mitigation technique gone out of style? If so, too bad because it appears to be doing its job of keeping hikers on the durable rock surface and off the nearby cripplebrush. It’s far less visually intrusive than a staircase. Installation requires much less material, time, and effort. True, it’s not made of a natural material but, arguably, neither is pressure-treated wood. I can think of several long stretches of steep, smooth rock (when slippery, it’s highly prone to hikers clinging to its edges) whose flanking vegetation would benefit from the installation of a cable handrail. It would also blend into the background far better than the highly-obvious, man-made structure along the Orebed Brook Trail. Most trails have a few “trouble-spots” that can be mitigated with minor re-routes, short ladders, bog-bridges, or other common, established techniques. The north sides of Upper Wolf Jaw and Armstrong come to mind. Then there are the trails that are simply hopeless because they were built in the wrong place. Michael identified the rogue’s gallery of trails. Cliff’s trail would require massive mitigation efforts and it’d be more effective (long-term) to move the trail to ascend via its (comparatively gentle) north or northeastern side. I’ll add the section of trail running north of Feldspar Lean-to to Lake Arnold. It runs through the watershed of the Opalescent and is frequently inundated (I call the area the OpeyFootSoakey Swamp and it’s home to the “floating bridge” http://i.imgur.com/WxSaQpF.gifv). The trail should be moved to the west to higher ground. Tony, Thanks for the insight. Clearly I’m not a total purist. I maintain 3 Lake Colden lean-tos. I think an absolute purist wouldn’t be interested in maintaining any form of structure in a wilderness designated area and would say the UMP that allows for them is flawed. I’d say that I come in somewhere between. More liberal than a purist and more conservative than the current land managers. It’s interesting to note that the pinned treads do have less of an impact on visual appearance when compared to the “Stairway to Heaven”, but that’s kind of like saying a Cessna burns less fuel and makes less noise than a 787. I see the logic behind thinking that treads keep people off trail edges and help to protect soil and vegetation. Do we know this to be true? Do people automatically use the improvements? I’m only asking because I have no data one way or the other on this. I see lots of muddy boot prints next to boardwalking, and I definitely get out on the slide when climbing Ore Bed (mostly because I absolutely hate those ugly stairs), so what is the situation with the pinned treads? SImilar? Maybe I missed it, but did anyone mention the “Brute Force” solution the state came up with? I’m referring to the new highway up Blue Mountain. It seems the state can do anything with the right motivation. If you call that the ‘right’ thing…. Yes, I do know of one instance where a trail might have contributed to a slide and that was on Pyramid during Hurricane Floyd in 1999. My father and I cut that trail (mostly old style) in 1966. When we reached the site of the current slide (1/4 mile above the col) my father commented that the soil was so thin here that the trail could cause a slide. Well, 33 years later a slide did occur there, although there’s no way of proving one way or another whether the trail actually caused the slide. I don’t propose any more cables such as exist on Gothics, but the year or so when the cables were gone did see an impact on the vegetation. People do use them, and the rocks actually seem narrower than they did when I first climbed the cable route. Experience with the pinned steps so far indicate that hikers do use them. Boot prints in the mud next to boardwalks are usually when the area isn’t all that wet, and hikers elect not to take the one step up onto the boardwalk. When it is really wet, it seems most step up rather going around. As for the Blue Mt. paving, that is all private land. I don’t believe the state had anything to do with it. Once again. Thanks for the feedback Tony. It’s very helpful in trying to get a handle on the issues. It’s a shame to hear cable handrails are no longer being considered. The cables have proven to reduce if not eliminate trail-widening; mission accomplished. Plus they last a long time despite bitter winter weather and sharp microspikes, snowshoes, and crampons. Time will tell if elaborate wooden staircases survive equally well. 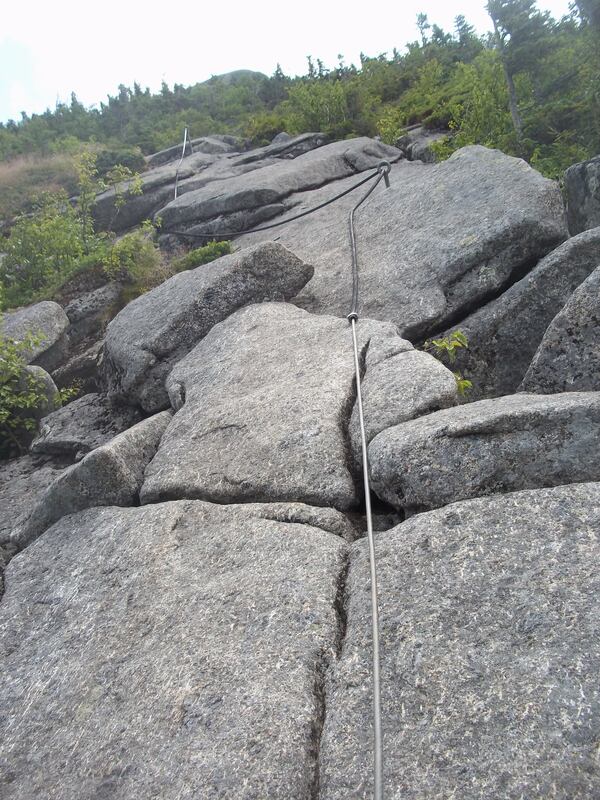 Let’s re-cast cables into small via ferrata sections. Judicious use of pinned steps and cable would clearly reduce the impacts in the thin-soil upper reaches.